The early evenings of April this year are dominated by the two brightest planets, each ruling their part of the sky. First off, as soon as it gets dark enough to see stars – say about nine o’clock – low in the west is the brightest object, Venus. Its highly reflective clouds of sulphuric acid ensure that this planet is unmistakable. To the left is another cluster, although less distinct: Hyades in Taurus, the Bull. This constellation is dominated by its bright red eye, the red giant Aldebaran. 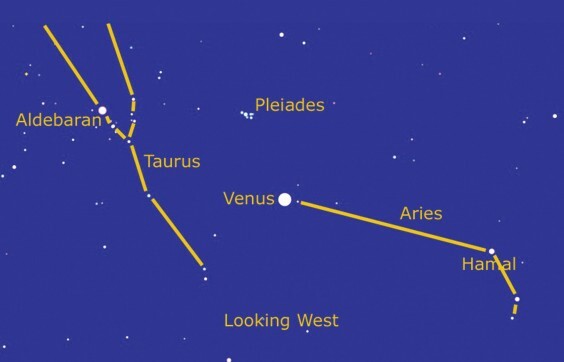 Keep a close eye on Venus during the month because, being closer to the Sun than us, it appears to move quite rapidly across the sky, travelling between the Pleiades and Taurus, ending the month high above them (and, incidentally, near a nebula called M1, which makes it sound like it’s on its way to that London!). By this time, Mercury will be appearing low in the west after sunset, occupying the spot that Venus was in at the start of the month. Look out for a crescent Moon close by on the 20th and 21st. High in the south is our other bright planet, Jupiter. Good binoculars reveal the four largest moons and the third one out, Ganymede, is now thought to have an ocean of water buried beneath an outer covering of ice. Jupiter is actually sitting in the constellation of Cancer, the faint stars of which form a sort of inverted “Y” but the real “star” of this patch of sky is Leo, just to the left. This fascinating constellation is easily located by the reversed question mark that forms the head of the Lion, with the bright star Regulus at its base making a triangle with Jupiter and Procyon. These are interesting stars in that they are both double stars consisting of a massive star being orbited by a white dwarf. The Asteroid Ceres has been in the news lately but I’m afraid it’s not visible, even with a pair of binoculars, despite being the largest object in the Asteroid Belt and having NASA’s Dawn spacecraft orbiting it. A good telescope should find it in the pre-dawn sky below Saturn and Altair. April the 10th should see the launch of another SpaceX supply vessel to the ISS and the 28th sees the launch of another vehicle with supplies, this time a Russian Progress ship. As these launches are due to be a couple of weeks apart, there’s a good chance of being able to see at least one of them as they approach the Space Station, so keep one eye on http://www.heavens-above.com and one eye on the sky (and try not to fall over! ).